Plastic bottles are a scourge of ecology. We use them constantly, but no one thinks that every thrown piece of plastic lies in the ground, not decomposing several centuries. But it is not every country that can afford the opportunity to buy expensive equipment for recycling such industrial waste. What to do in this case? Let's use plastic to decorate our homes! If you use a little imagination and time, youYou can create absolutely stunning crafts from unnecessary bottles. 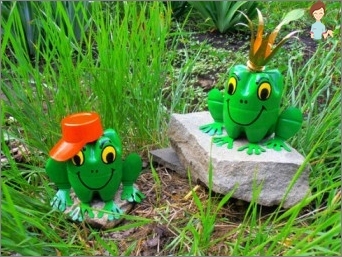 For example, you can use plastic containers for watering plants. To do this, you need to cut off the bottom of the bottle, and in the lid to drill a few holes. Then insert the resulting structure with the lid down and pour into the water. Attention! The volume of the container must fully correspond to the volume of the earth. So if you decide to water this way home plants, then the optimal option will be two-hundred-capacity containers. But if such a device can be useful in your greenhouse, you can try using a five-liter container. You can find the use of plastic containers in anySphere of life. For example, you want to help small birds, which are very difficult to find food in the winter season. In this case, you can make a small feeder from the bottle. The main thing is that the edges of the feeder are carefullyProcessed and birds could not get hurt. To make such a feeder you can also attract your children: they will definitely find such a creative activity very interesting. And the final touch of manufacturing our feeder is screwing the screw into the cap. With it, you can hang a made feeder on a tree or a window sill. Attention! It is not recommended to hang the feeder by the neck. Firstly, when the rope is stretched a little, it can simply jump off. And secondly, the bottle suspended from the neck may just bend. And this will certainly lead to a rash of cereals on the ground. First of all, it is worth noting that, as shownPractice, almost everything can be done from plastic bottles. In history, there have even been cases when houses were built from this material. The mechanism was very simple. Working in the same way, as usual, bredCement, but instead of bricks used plastic containers filled with sand. Of course, you will not stand so much in a dwelling house, but for a small country cottage this option may be suitable. In the same way, you can decorate the house from the outside andFrom the inside. To do this, you need an idea and a few plastic bottles. At the moment when the walls are being built, you need to place the plastic in fresh concrete so that the pattern or pattern you need is obtained. Then, when the walls are already dry, take a little paint and paint the elements of the created pattern in the appropriate color. That's how it turns out an interesting mosaic. The undoubted advantage of creating such a mosaicWith your hands is that you can use bottles of any configuration. Above all, do not forget to put sand in them. Otherwise, a sufficiently large weight of concrete and bricks will simply crush an empty container. 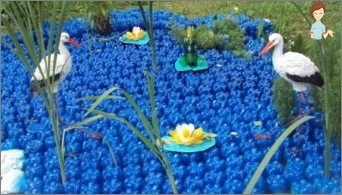 What else can you do for a garden of plastic containers? Well, for example, a fence. No, he, of course, will not be protective, and the child can break it, but here visually, he will look very elegant. Just fasten the bottles together with a mesh orWire from both sides. The edges can be painted in any color. And, if you want, you can even create some beautiful figure or ornament. In general, in the coloring process, you need to rely solely on your imagination. By the way, you can use plastic not only forCrafts for dachas from bottles, but also for roofing. If you have a roof house cottage, you can tie a few bottles, cut in half and close them problem area. Thus, you will have the likeness of a slate coating. So you can save the ecology and save money. Well, if you are an extravagant person, you can cover the entire roof in this way. If you can still sort out bottles, then whereTo leave a lid - remains a mystery. But if you have already collected a lot, you can decorate the fence. You can choose between beautiful ornament and the whole picture. Here, for example, you can completely stunning fence on the garden, using the lids as mosaic elements. The secret of this design is very simple: You need to determine the picture and paste the caps in strict sequence with the help of a regular clerical glue. Of course, in order to create such a picture, you need a huge number of covers, but, in my opinion, the result is worth it. From glass bottles you can make quiteNice decor elements, the presence of which in your apartment will create a completely unusual atmosphere. And today, we will consider how to make a small decorative vase. For this we need a bottle of brandy and a hank of colorful threads. Do not forget also about PVA glue. Now you need to thread the whole bottle. But you need to do this so that the glass is not visible. We recommend starting with the neck. Here you fix the tip of the thread on the glue and slowly begin to wind the yarn on the glass. As winding, you can in some placesApply a small amount of glue. This precaution is necessary in order that even with sudden movements, the thread firmly held on the bottle. The end of the thread must also be fixed with glue. So our vase is ready! You can put in it artificial or dried flowers. But with living it's better not to take risks, because pouring water, you can accidentally wet the joint place, and this is fraught with a complete unwinding of the threads. 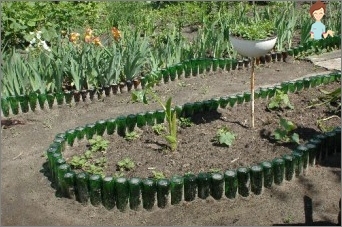 As you can see, crafts made from bottles can not only decorate our dacha or garden, but also help to save on building materials. The main thing is to believe that you will succeed!